There is a safety message that appears in most aircraft safety manuals that says, attend to your own oxygen mask before you attend to others’. No-one expects to find themselves in that situation but there is a nugget of truth to be found in helping yourself before you try to help others. One of the hardest things about being a social entrepreneur is that you can quickly get tired, lonely and lost if you don’t have a strong support network around you. With this in mind, it is worth, very early on, giving some serious thought to your own support needs. Find a mentor that will help support you through the process of setting up a social enterprise. Mentors can offer a valuable insight into your challenges, can be an ear to listen to your issues and can help focus you on the parts that matter most. Try and think within your existing network who might be best able to assist you when setting up your social enterprise. You might be able to get support from your Local Enterprise Office or from your nearest Partnership. 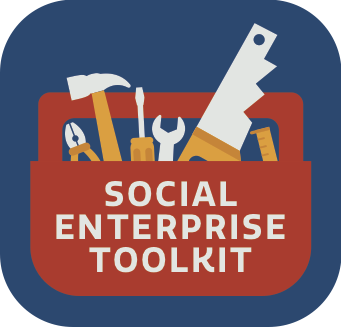 Networks can often be a valuable source of assistance in getting your social enterprise off the ground. It is not just about business, but networks that gather like minded people together to share stories and information and even asking for help if you can be clear on your ask. There are a list of networks in this toolkit that you should consult. It’s important that you give yourself time to learn new skills and experiences. Once you are in the cut and thrust of social enterprise development, it is perfectly OK to spend a moment concentrating on you. Be careful not to ignore your own learning and skills development. Make time to speak to others, reach out, listen to other stories and continue to learn. You might just find something useful! Starting a social enterprise can be a huge time commitment and can lead to some stressful times. It is important to look after your personal life and your own priorities before even embarking on making a social enterprise happen. Make sure you are checking in with friends and family and open up about what you are doing early and often. It’s those relationships that will catch you before you burn out! In the business world, networking can be poorly mischaracterized as a chance to sell, sell, sell. But networking can be a real opportunity to find new connections in your industry or others. It can afford you new relationships and can open you to new technologies, new standards, new products or other things you may not have thought of. Make sure to catch up over coffees and to engage online and grow your wider sphere of influence. Never underestimate going to give a talk or meeting people for a quick meeting. If someone seen you speak at something or had seen you were mentioned in a newspaper, it can go a long way in raising your profile and have customers trust your social enterprise more. Make time to ensure you are being seen. Qualify – Make sure you’re talking to the decision maker. Close – Don’t be afraid to ask. If you work hard, if you are open to the risks and you are focussed on your goals, you are well on the way to having your social enterprise thrive.